Soak up the sightseeing trips and Lake Maggiore activities, with this budget-friendly balcony retreat! Perfectly equipped for couples and groups of 4, this modern 1 bed apartment offers a convenient resort location, being just one minute’ walk from central Baveno and its railway station. Inside, the 2nd floor apartment features a generous Open Plan Living space equipped with SAT TV, a games console and free WIFI. The modern interior is also complemented by a sunny balcony and a dining area for 4. The separate Kitchen is fully-equipped to cater for your culinary needs too, whilst away. A spacious Master Double bedroom with balcony is accompanied by a Double sofa bed to the Living room and a Bathroom with Tub and overhead shower. Complemented by private laundry facilities and on-site parking, the budget-friendly retreat offers a truly carefree holiday base. Situated in downtown Baveno, a stress-free holiday awaits; with a great range of Lake Maggiore activities accompanying the wide selection of authentic restaurants, open markets and shops (all within walking distance from the property). The lake town is also well-connected by ferry to the other lake towns and the famous Borromeo Islands. The town’s railway line also goes from Milan to France, making Baveno the perfect base for exploration; as well as for a car-free holiday! The public beach, fantastic Lido, sailing school, boat rental service and lake view bars are also just a short walk away from the holiday apartment. Nearby, the famous resort of Stresa is home to the Villa Pallavicino attraction and the Botanical Alpine Garden (reachable by Mottarone cable car). The resort is also a popular destination due to its golf club and Jazz festival. 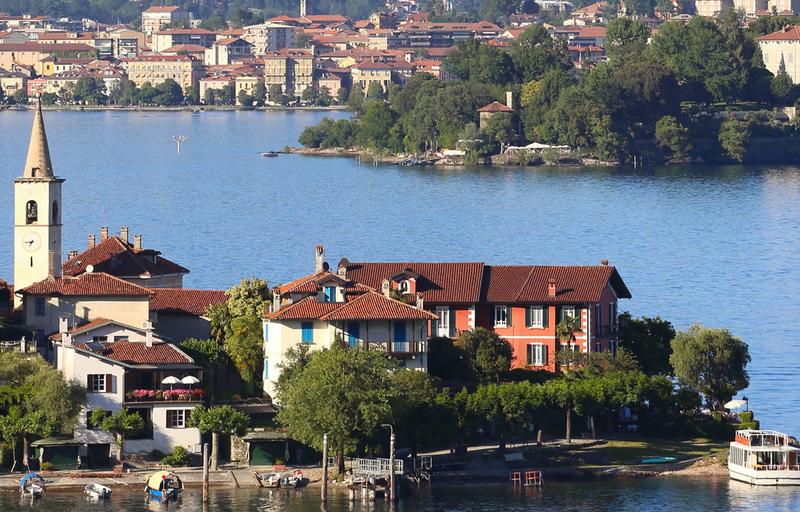 As well as glorious vistas and magical Italianate villas, Lake Maggiore is well-known for its water sport and sailing clubs, its wildlife parks, fine botanical gardens, golf clubs and Swiss Italian Alp ski resorts. Ideal for a couple or group of 4, the apartment offers that welcome touch of flexibility. • Upon request, travel baby cots, high chairs and single adult camp beds can also be hired. The private balcony invites you to soak up some sun, whilst a lovely L-shaped terrace to the side of the residence offers a great spot for sunsets and sunrises! Guests can also enjoy the lovely range of on-site facilities during their stay, including tennis courts, a fabulous outdoor swimming pool and a useful boat mooring facility. The residence offers a private parking space for those bringing a car. The beautiful residence is a short stroll away from the old town centre of Baveno, where a selection of shops, authentic restaurants and lake beach await. Guests are also a short stroll away from a train station (with links to Milan and France) and the ferry stop, which offers a touristic Island ferry service and links to the principal towns of the lake. The convenient location of this home truly means you can leave the car at home! A Sailing school, boat rental service, stylish lake view bars, a host of different restaurants, grocery shops and authentic art craft shops also await your enjoyment, here in Baveno. With the Golf Club of Gignese also just 3km away and a 10% discount on offer for local Golf and Ski hire equipment, the scene is set for enjoying an active stay! Baveno is easily accessible for year-round stays; being located just 45 minutes’ drive from Milan Malpensa, 85 minutes’ drive from Lugano Airport and 1.5 hours’ drive from Bergamo.